Last October, I had planned to make Christmas dresses for all three of my girls. That was before we knew Iris didn't get the memo. Had I known, I would have laughed at those plans. But I didn't know, so I bought 3 yards of a wool/cotton blend in cream. 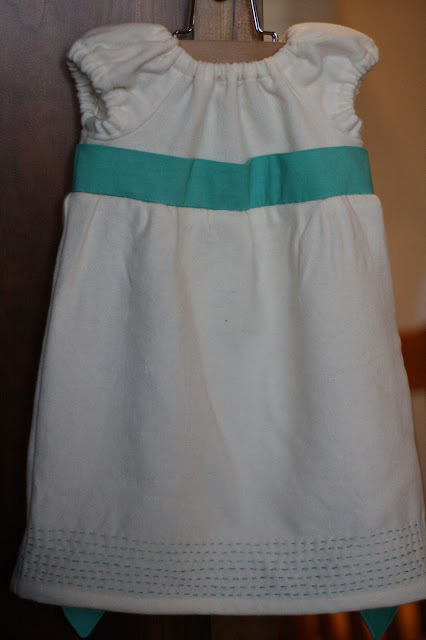 Having that soft, luscious goodness laying around, along with a hankering to do some garment sewing, I couldn't resist turning some of it into a baptismal dress for our dear Iris. There was no doubt I needed to keep it simple. This wasn't going to be a fancy, satiny, traditional gown. It would not be a fancy, traditional baptismal service. I had this Portobellopixie pattern in mind, without the apron. I do believe this pattern has been discontinued. But when I occasionally have the opportunity to page through pattern books at chain fabric stores, I have noticed that they are coming out with patterns that are nearly identical to this one. I suppose imitation is the highest form of flattery. 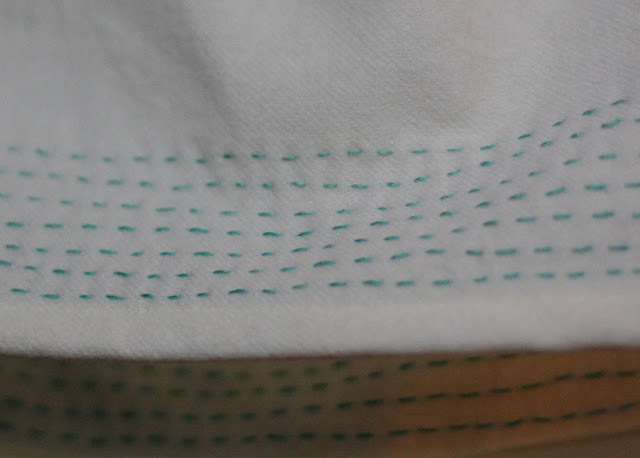 Inspired by this and this, I added seven rows of hand embroidery in the form of running stitches, the first four in a darker turquoise and the top three in a lighter shade. 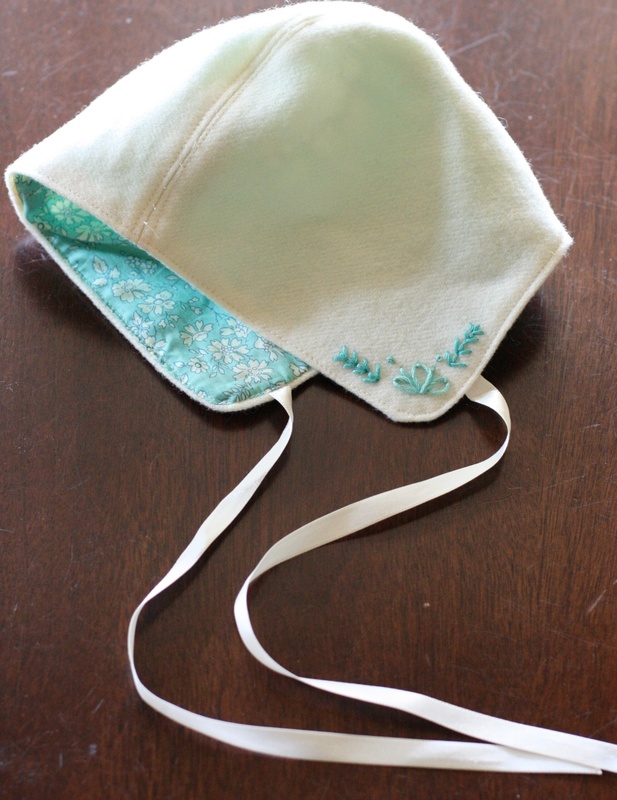 I saw the Storybook Woods bonnet here and purchased the pattern here. It came together quickly and easily. I enjoyed learning some new hand embroidery stitches which were described incredibly well in the pattern instructions. 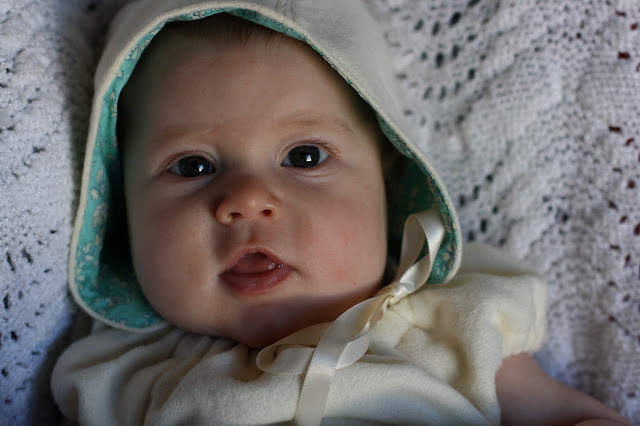 Little did we know until we put that bonnet on that she would be our sweet Amish baby. 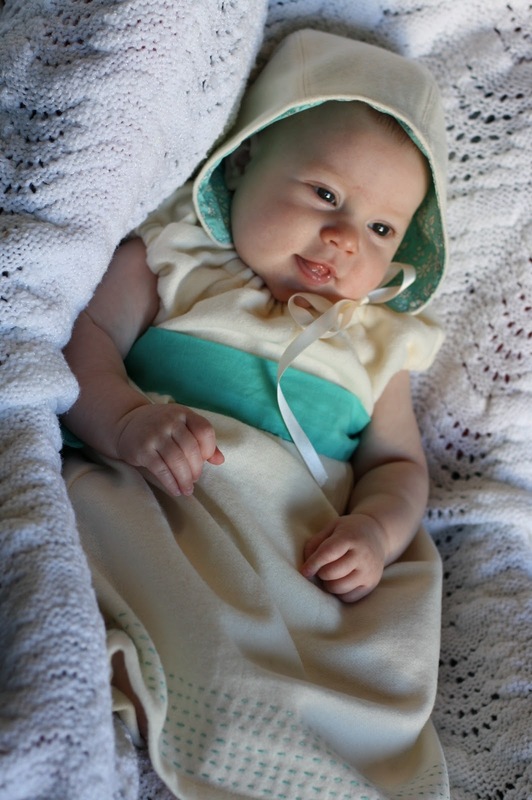 I'm quite sure we called her Amish baby the entire time she wore it. At first, I wasn't so sure I liked it. But Dan said she looked adorable. The look then grew on me quickly and ferociously. Now I'm not sure she could be any yummier. what a gorgeous baby!! i love the gown and bonnet - especially the blue accents. baby girls should wear more blue :) such beautiful work! 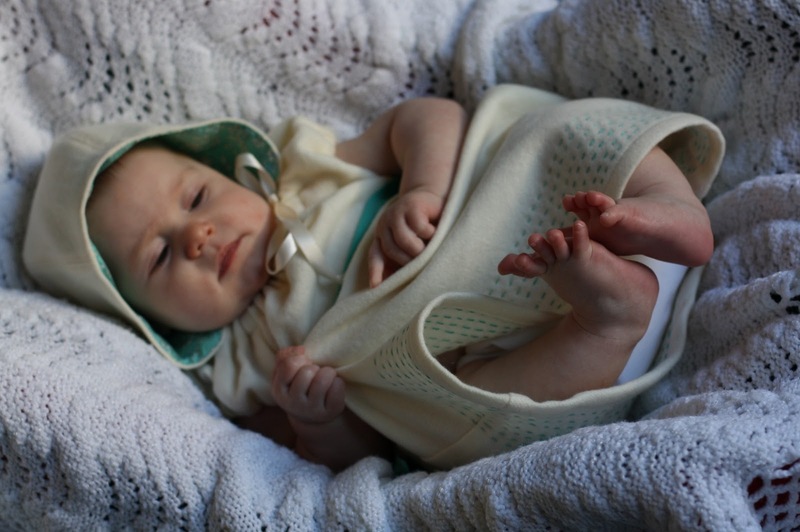 I know this is a long shot but do you remember how old your baby was and what size you made? I made an XS for a baby shower and it looks impossibly tiny! Then again babies are impossibly tiny.